My life was all an act until I decided to change roles. For me as a young teenager, school was about putting on an act. You know, the way the bad guy in the movies delivers the smooth, clever lines and comes off super cool in the process? I yearned to be able to do that. I tried to rule the screen just like the best of the bad guys. I pretended my morals were low because I wanted to impress my friends at school. I loved the sound of laughter when I used inappropriate language or joked about people. Since I wasn’t actually committing the serious sins people thought I was, I desperately tried to convince myself that it was OK to have a rough attitude. I was so wrong! My real-life movie-screen hit reached the point that I couldn’t stand to watch it myself. The more popular I became, the less I liked the character I played. One day, two of my friends were talking about a sweet, friendly athlete named Jennifer who wasn’t embarrassed to stand up for her beliefs. One of my friends, the most gorgeous, popular, and smartest girl in the seventh grade, said, “Jennifer is so different. I wish I was brave enough to believe in my church like she does. She’s the only person I know who lives her life like that.” I was stunned. “How could she say something like that without even mentioning me?” I wondered. “After all, my church has high standards!” I was furious that she hadn’t even considered me a good example. 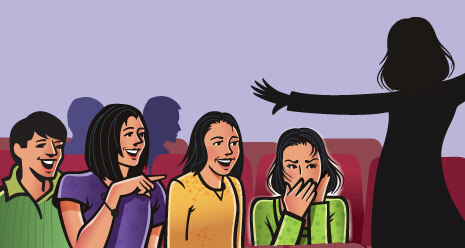 Then, suddenly, I felt like I was sitting on the front row of a movie theater showing my life as the main feature. I reflected on the poor example I had been to my friends. What kind of kid was going to watch me and think, “I wish I was brave and unique like her”? I really disliked who I had become. Changing my character and reputation was a long process, and I’m still trying to keep my mouth shut instead of blurting out crowd-pleasing insults. But I realized I could make my friends laugh without hurting someone else’s feelings, and I could leave the room during a crude joke without being ridiculed. No one has to be a “bad guy” to have lots of friends. I changed my attitudes and behaviors because being at peace with what I believe is so much cooler than trying to hide who I am.